The panoramic (Pano) feature in the standard iPhone Camera app is a great way to record wide and imersive scenes that you wouldn’t normally be able to capture in a single shot. Panoramic photography, just like any other type of image capture needs to be planned. What is the main subject, where should it appear in the composition? 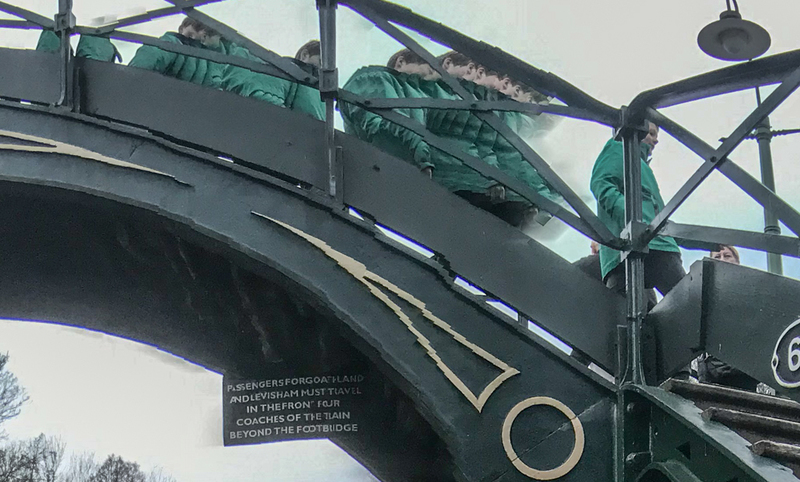 The stretched shape of the panoramic image is an unfamiliar format to most viewers so careful thought needs to be given to how you will lead their eyes through the picture. Consider where the image will start and where it will finish. Are there any any distracting elements in the shot? If people or objects are moving through the scene, you could let them pass, if the distracting element is permanent you may need to choose a different composition or even remove it later in Photoshop. Check to see where the sun or other main lights are in the scene and prepare your exposure accordingly. The normal AE/AF lock (touch on a chosen area of screen for a couple of seconds) still works with the Pano option. In the shots of the station above, I locked the exposure on the station entrance to avoid this area overexposing. Most smartphone photographers enjoy the portability of their camera and don’t want to be restricted by tripods or other accessories. For this reason, most smartphone photographs are taken ‘hand held’. The serious panoramic photographer would use a tripod and possibly a special panoramic tripod head designed for this type of work. 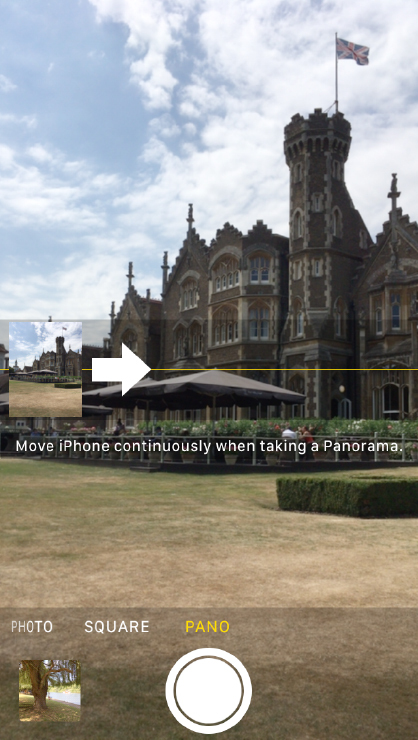 The Pano feature in the camera app does provide some guidance for the smartphone photographer. The built in accelerometer detects when the camera is tilted away from its starting position and guides the user to make corrections. In the image below, the large white arrow is the current position of the camera, the yellow line is the level which you should try to keep the white angle on as you rotate. In the screen shot from the camera app (above), the panoramic image will start on the left and pan right, this is the default but if you want to pan the other way, click on the large white arrow to swap. You should practice the shot a couple of times to check if the composition works and how you rotate the phone and your body. You should check the shot carefully as some problems are hard to see on a small screen. Parallax is a major issue with panoramic photographs, particularly with subjects with a lot of straight lines such as the examples in this post. This is one of the main advantages in a dedicated tripod head. If possible, try to rotate the phone close to the body rather than at arms length. Detail from panoramic shot showing distortion to track due to parallax and some camera movement. Detail of panoramic shot showing subject movement. As the panoramic picture is recording an extreme wide angle image (up to 360 degrees) on to a flat 2D image it will often show extreme distortion (two images below). Panoramic image from below a foot bridge. Taken with iPhone 7 and Moment Superfish lens. While it doesn’t quite fall into a post on panoramic photography, I thought I would test the TinType app on one of the pictures. As a passionate film (analogue?) photographer I should have a real issue with apps like TinType but perhaps, it could be a ‘gateway’ app which opens people’s minds to the wonderful world of early photographic techniques? All images taken in this post were shot on an iPhone 7, some were captured using the Superfish V1 Moment Lens. 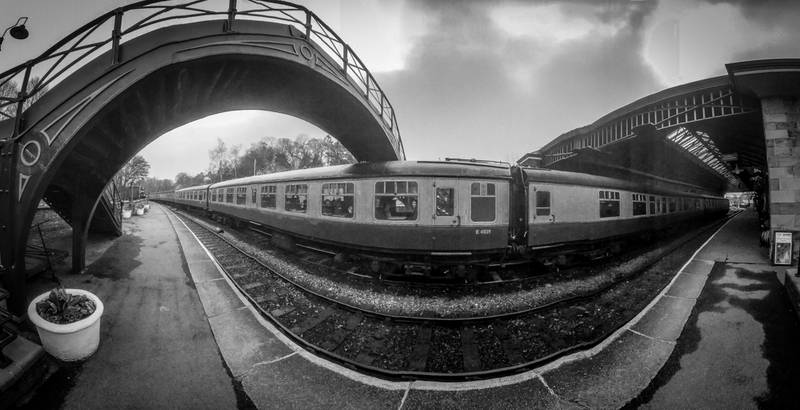 All images taken at Pickering Station on North Yorkshire Moors Railway. Panoramic photography is just one of the topics I cover in my ‘Selfie Help Workshop’ to help people take better pictures or video with their smartphones. Please contact me if you would like more information.